One of the most important things about the much-loved Lord of the Rings trilogy and subsequently the upcoming adaptation of The Hobbit is the visual effects. No surprise the wonderful Weta Digital (which handled visual effects on LOTR) is back for The Hobbit, and I'm sure with the advancement of special effects technology since "the trilogy" came out, The Hobbit visuals will look better than ever. On the subject of The Hobbit's visual effects, The Associated Press recently caught up with Richard Taylor, creator and head of Weta and he spilled some info on what stage The Hobbit is currently at. Specifically, Taylor talks about what stage Weta is at with the film(s) and even why he thinks Peter Jackson decided to hand the director's chair over to the brilliant Guillermo del Toro (Pan's Labyrinth, Hellboy). "[Jackson probably passed it on] because he's spent so long in Middle Earth ... and probably felt a director such as Guillermo could bring something passionate and unique and original and new to the content for the sake of the fans." "It's an absolute delight to be working with Guillermo Del Toro. We've all enjoyed his craft as seen in 'Pan's Labyrinth' and the 'Hellboy' movies. His unique aesthetic and storytelling style brings a lovely aesthetic to the world and one we're enjoying being part of." "We're just patiently waiting for it to begin. It's been in early development for a while. I'm sure it will get going some time soon." Even if the film hasn't started shooting yet, Weta has already started working on the effects, and Taylor says Weta has even begun designing the landscapes and characters. Fans of the look of the Lord of the Rings trilogy will be very glad to know that Weta plans on using a similar aesthetic in The Hobbit. "Like any film, there will be an effort to utilize the tools that are available to us today to achieve visual images that will excite and intrigue an audience as we did try 10 years ago." I'm not a big fan of 3D and don't like the idea of The Hobbit being done in that form. Having said that, if it does turn out to be in 3D then if Weta can utilize the technology in the same subtle way Avatar did, then it might turn out great. I'm just glad, as a fan of how the LOTR characters looked, that they're keeping things consistent on that front. That way The Hobbit Parts 1 and 2 can be viewed together with the LOTR movies without there being a stark contrast in how it looks, at least as far as the characters go (I'm interested to see how del Toro's aesthetic affects the rest of the visuals). What do you think of what Taylor has said: Glad that they're keeping the look of the characters consistent in The Hobbit with LOTR? Would you like to see The Hobbit go the 3D route or is best left in two-dimensions? 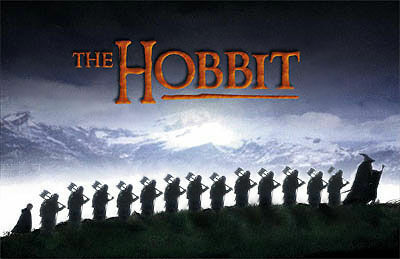 As stated, it looks like The Hobbit is going to start shooting this June. As far as we know (possible delays aside) Part 1 will hit theaters in December, 2011 with Part 2 following a year later in December, 2012.